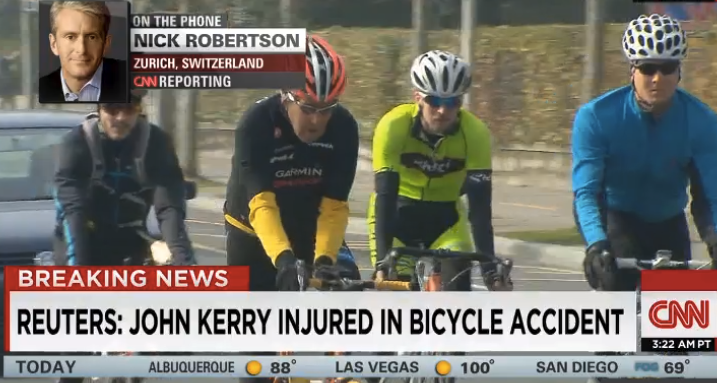 Today the news comes that 71 year old U.S. Secretary of State John Kerry has broken his right femur while cycling on his custom Serotta (made in U.S.A. -- essential for a politician, and custom -- justifiable for someone as tall as Kerry, even if you are not married to a billionairess) during a trip in Switzerland. What a great job -- negotiate with the Iranians about their nuclear program, then hop on the Serotta for a spin in the nearby hills. (Note the Olympic rings in the background of the photo above -- just a spin by an IOC office on the way out of town? And he is accompanied by paramedics when riding, so in case of injury, just a quick airlift back to a hospital in Geneva, then another airlift home to a doctor in Boston. Still, one does need to be extra careful when cycling with jet lag ... and this accident is a reminder to all of us. Easy to hit a curb when your head is in a fog and you just changed continents. And those guys riding with him ... do not really look like much fun as cycling buddies. Maybe Secret Service in disguise. Or Swiss security (it is a BMC bike, after all) on loan. I guess the guy with the backpack maybe has some weapons or communications gear. I guess the next time I miss a curb and go down hard I will be happy it is not "breaking news" on CNN. Meanwhile, after a cycling accident in Central Park last fall that shattered his arm in 6 places, resulting in some serious "hardware" -- 3 plates and 18 screws -- it is good to see U2's Bono back on the bicycle.